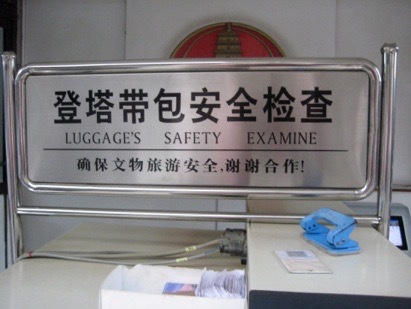 Chinglish: a discussion of poor use of English in China. 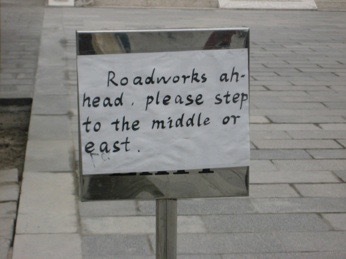 I have been much amused at the translations of Chinese into English as found on signs around the country. One recognises Noble House, Honorable Mansion (sic, the US spelling is more common), but the more extreme ones (to be inserted after I eventually go and photograph them) are just hilarious. Mundane examples are to be found on the motorway to the airport, “No drunken driving” doesn’t compete with ‘Don’t Drink and Drive’, but “Rear-End Collision” does need replacing by “Keep your Distance”. So you can imagine my reaction when my colleague, Ningyu, who holds a curiously secure position at the school, invited me to participate in a meeting of people who are English experts in some sense, with the express purpose of correcting signs and improving translations. Going to the meeting involved leaving the staff meeting (embarrassing, since I chair it) and catching a taxi into town, to the West Gate. Various mobile calls ensue as he hunts for Tina, another colleague, who is also to be at the meeting. Tina teaches Business Studies and has good spoken English, having had some years in NZ. I am introduced to a Madame Wong and left with her (no English, which matches my Chinese, still); she finds another member of the group, an ageing gentleman with excellent language skills and a background at Cambridge as a genuine student and current employment at the North-West University in Xi’an. Considering that there are allegedly 17 universities, it is curious to me that there is only one I have come across. That may be an expression of local bias in the contacts, I suppose. The group meets out in the street at some unobserved signal, probably another mobile call, and straggles from the meeting point snuggled up against the city wall (a mere 6m high at this point and wide enough at the top to drive on) the 100m back towards the West Gate. I am required to be in front, apparently, which is no great problem since I walk about three times their speed even when strolling, but since I don’t know where I am supposed to be going, this may rapidly become a problem. On rounding the corner by the Gate, just on the outside of the Wall, I spot Tina and some others, so apparently I do good leading, since I found the missing section of the group. There are now about twenty of us and we struggle across the busy street to an appointed place. eight million and the province about forty and also that nothing is clear when titles are translated. After all, in school the three form teachers in my little section, at a stretch each being ‘head of year’, are each called Head Teacher. We are stood in a messy group around two huge stones on the corner of the crossroads immediately across the junction that is outside the Gate. 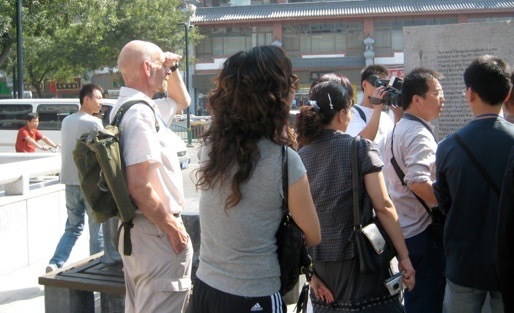 The group is enlarged by inquisitive shoppers and a passing drunk. One of the stones is a short squat metre cube with Chinese and English on the top face and it transpires that this is one of the ‘tasks’ for the day. 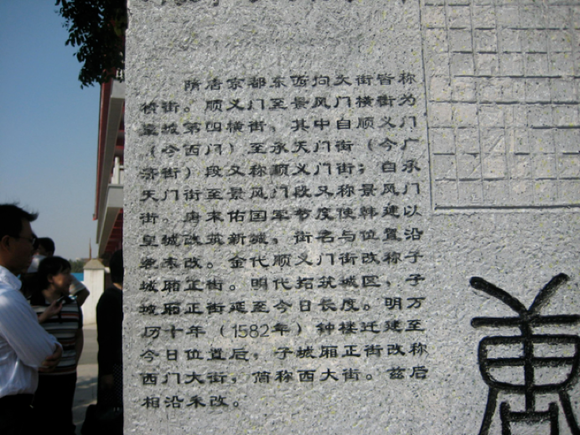 The other is a tall rectangular slab with Chinese one side and English the other. I realise Ningyu (who has gone back to teach) has given me the English side as a photocopy already. The text has almost no verbs and I include it far below. I rapidly become involved in trying to decipher this verbiage and come to the conclusion that it makes so little sense that it really needs the genuinely bi-lingual to read the Chinese and attempt a better translation. I persuade some of my new colleagues to read the other side first. Photos are taken of both sides for subsequent study and I recognise that cameras of the tv variety have appeared while I was looking elsewhere. Tina and Sacha (just met and introduced) form a double act, putting words in each ear (of mine) and clearly each capable of doing a far better job of translation without my input. The squat stone renders itself to a reasonably sensible set of words, but there is no co-ordination to the group and I have the suspicion that there are academics here running off at tangents in an archetypical and asymptotic style, as I detect that some of the conversation around me has not approached the stones at all. 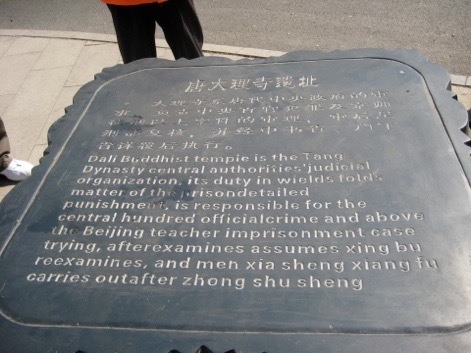 The Chinese, probably thanks to Confucius, give great deference to large rocks, preferably weather worn and wholly holey before being treated as holy. This is a headstone, a square-cut block rising out of a more rock-like plinth, is about 1800x800x200. It really shouldn’t wobble. I touch it, only to discover that this is a plastic mock-up - and so is the other. Relief: I was wondering how to say nicely that the stonemason had wasted a day or two. In Delabole this size stone would be a very expensive piece of rock. After an indeterminate but short period we are herded onto transport (maybe three seats short) and driven to a restaurant. Why, becomes slowly clear. We are ushered to a large room and are sat at a large circular table, with myself, embarrassingly, at the immediate and significant left hand of the State official. Menus are produced and I am thinking that we cannot possibly be eating again—it is maybe 14:15—and that the group had already had a grand lunch, which would explain some of the lack of concentration. No, we are here to revise the menu. Tina has rearranged seating so she is next to me if required to translate and we work through the first introductory paragraphs of the menu. I eventually pull out my iBook to record the thinking (I am on my way home, so of course I have it) and feel a frisson in the room as the higher tech gadgetry is revealed. I suspect cameras are being wielded behind me but we are concentrating on the words. 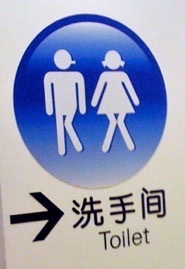 I conclude that a really free translation is required. 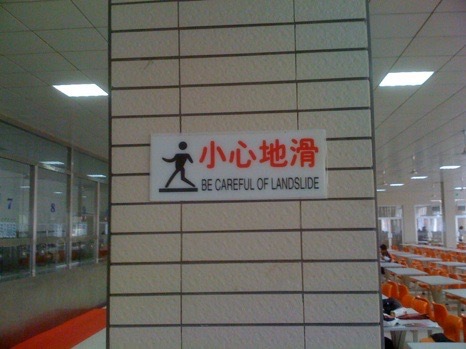 I have been fighting with Chinglish for the last two weeks in reading the students’ UCAS personal statements and this is no different. Even (or especially) after all we do is change the odd word for a better choice, it still doesn’t read. The languages are so very different and the cultures so far apart that many phrases simply don’t sit well in the second language. I’m certain it works both ways. We need a copy editor, an advertising writer, not a token Englishman and not a collection of English language teachers, which is what I am beginning to think the group is formed from. After maybe twenty minutes, Tina and I are making some progress and I recognise that others round the table have been working through the menu itself. At some signal I don’t see, the Minister ups, shakes hands (with me) and sets off out, probably catching some more camera time (but she doesn’t seem at all fussed about these things: I saw a busy and dedicated woman at work, not a presser of flesh manipulating opinions). The group begins to break up and Tina and I are collared for ‘an interview’. Why, I wonder: is this the token foreigner being used? Is this yet another facet of the overwhelming welcome offered to folk from a long way away? The cause of that is down to Confucius (Kong Zhe) who said something along the lines that a friend from far away was deserving of the best hospitality you have to offer. So an interview takes place, on a nearby sofa; Madame Wong on one side and Tina on the other, me answering in English and Tina translating. The camera follows everything and I am wondering how this can be edited to make sense; perhaps Tina’s voice on top of mine? I am asked about the group (as if I could know yet) and whether I wish to join it. I say I think I have, that I think it is what I have been looking to do since I arrived. One of Tina’s answers was very much longer than mine, and I am unsure if I want to know what she said. Now quite overly warm (it is funny how future public attention has that effect), we descend to the ground floor although I had not remembered that we’d come up any stairs) and find the residue of the group heading slowly outside. I realise we are still not far from the West Gate; I exchange e-mail addresses with Sacha and wish yet again for a business card. Tina’s last action before descending was to write my name in Chinese characters (se gong se, or similar, is quite funny since se/si (4) is rated as unlucky) and to declare my title not as ATL but as Executive Principal. I am concerned that others on the staff will be offended, but I learn the following day that she has rendered a good translation of how my post is referred to in that language. I still say titles don’t translate well: Academic Team Leader is quite apposite. Tina has a hankering for coffee and there are apparently three Starbucks within easy reach. Another new experience and easily tackled in English and in Chinese. A very pleasant couple of hours pass, and I use chance opportunities to use the WiFi in the café. Last, another new experience; the magical 608 bus back to Gaoxin. A whole yuan (about 7p) and twenty minutes later I am within 150m of my flat. Unbeknownst to the two of us, while waiting for the right bus to arrive, the interview was being shown on local tv: Tina’s father was well impressed to see her on the box: I can’t imagine it being interesting outside family. Why do I call this essay An English Club? Because that is exactly what it is: a club for those able in English. Ningyu told me the next day of the next week’s meetings – Weds and Thurs afternoons of this week; I am teaching, of course. I will try to find out if any meetings are arranged on days I can attend. This level of exposure must be good for school and Dipont. Sui and Tang dynasties Kyoto palace wall fourth horizontal street (west avenue). The Sui and Tang dynasties Kyoto thing all calls the horizontal street to the avenue. Along the virtuous family to the scenery airthrottle horizontal street for the palace wall fourth horizontal street from is suitable the virtuous family (now West Gate) to receive the fortanet street (now Guangji street) the section to call along the virtuous family street; calls the scenery airthrottle street the self-supporting fontanet street to the scene airthrottle section. Tang Moyou national troops military commisioner Han Jianyi the palace wall gai zhu new town, Jie ming changes with position the end of following. 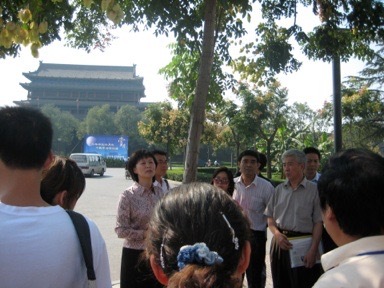 The Jin dynasty renames the child city street along the virtuous family street. The Ming dynasty develops builds the city, the sub-city street delays until today length. The bright Wanli ten years (in 1582) the bell tower rebuilds on a new site after today position, the sub-city street. Renamed the west gate avenue west the abbreviation the avenue. After this, along has not changed. Yeah. Right. fortanet? airthrottle? gai zhu is untranslated Pinyin; so probably is Jie ming (I think that is Ming Avenue). The following week, Sue, the wife of ‘Physics’ went to the Grand Opening, elsewhere in town, following up with a trip to do work at the Terracotta Warriors (see the essay of that title and where the signage is already pretty good). There has been no meeting since early November - it is now early February. I have photos of various bits of text around. What I need is a postcard-sized notice in Chinese and English to hand (both meanings) to hand into the shop (or whatever) that says I have seen “this bad English” and I suggest “this better English” and if one would like to discuss it to call Madame Wong or email me at ..... But, since the group has no website, no known address or even a workable title or contacts, this isn’t going to happen unless I do it myself. Perhaps I can turn it into school advertising? There are several errors in the little English used at the opening ceremony. Photos added 2010 and again in 2012. I dispute the spelling (starups? standardizng? ), the use of capitals (and not) and the choice of words. Connects, perhaps? Standardising or -izing? 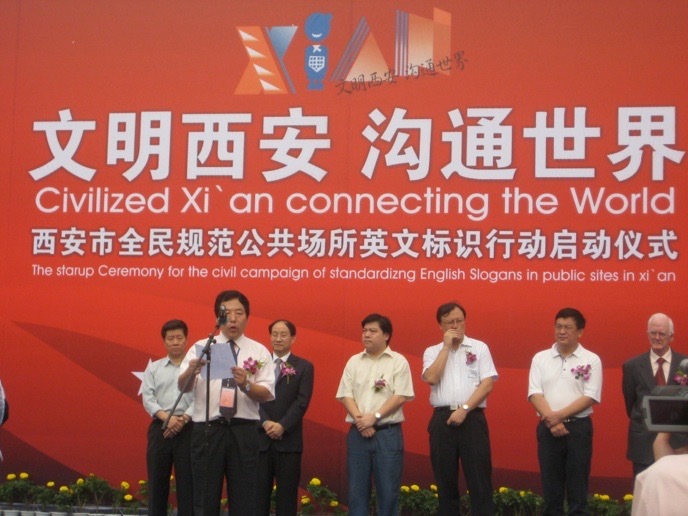 Xi’an, not Xi ‘ an and xi’an; civic campaign might be better than civil campaign. Why Slogans not slogans? Why not just start again? Just how many mistakes were squeezed into 16 words? Right, in one of the super-markets in ZhaoQing and also found in Qingdao. Absolutely delightful and worth using worldwide. This, left, is to be found in the canteen at the main site of NFLS, Nanjing. 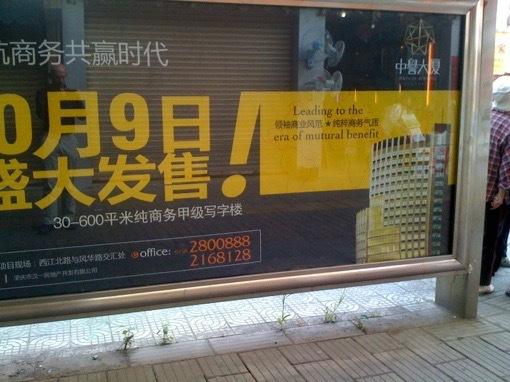 Checking in July 2010, the other notices are only in Mandarin. What do you think it should say? This, right, has been a sight just outside the south gate of the estate where I live in ZhouQing. I hope this applies to an insurance company.